I don't think introverts actually define themselves as introverts. Instead, we know the feeling, the uncomfortable moment of human interaction after you say something in person to someone and you suffer the potential ego death while awaiting their reaction. It's not that we don't want to express ourselves, our interests, desires and personality. To the contrary, we do. It's just too difficult and painful to do so. Back in middle school they called us quiet or shy. They still do. 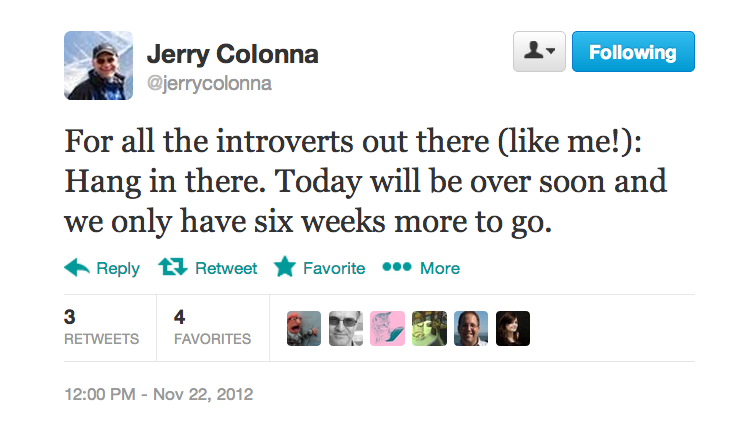 For many introverts, the Internet was and remains revelatory. Allowing for intimate (yet distant) connections that are asynchronous (yet real time), anonymous or pseudonymous (yet expressing identity), frequent (yet levying no cost to walking away from), and multi-dimensional (yet involving no eye contact), at some level it feels like the "Internet" was designed definitionally to solve each and every insecurity of the introvert. I recall with total specificity the first time I dialed into the SonicNet BBS in 1995 using a Gateway computer from our apartment on T Street in Washington, DC; really, it blew my mind. People just talking about stuff. Strangers. Compadres. And therein lies the Introverts Dilemma. Because the Internet so readily solves the problems for us, it has also spawned new ones. For these online connections, discussions, friendings, tweets, message boards and sharings, over time all invariably lead to . . meet ups, IRL get togethers, face to face human contact. Participants in the online groups we join in eventually want to meet each other with real life person-to-person interactions. "Hey we should get together in person." "Let's do a meet up someplace." "Let's have coffee we should get to know each other better." It's natural and beneficial; but man, the horror for the introvert. I was thinking about it this morning, however. Maybe unlike other dilemmas this introverts dilemma is not a problem, but a solution. I force myself to talk in public even though I abhor it. I am pretty sure I have chosen the profession I am in even though it forces me to meet people all day. I have made amazing (or lucky) personal decisions because she makes me confront the quiet. Perhaps all these things occurred because otherwise I would sit alone all day and talk to myself, in my head. Thanks Internet for, in part, solving this dilemma for me by opening up the world to these possibilities.